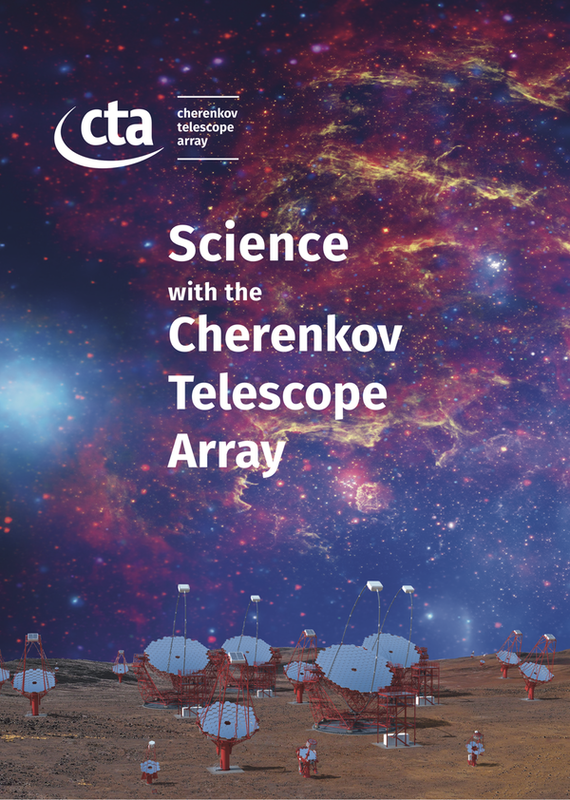 The latest iteration of the Cherenkov Telescope Array’s (CTA’s) science case, Science with the Cherenkov Telescope Array, was made available today via the CTA website library and arXiv and will be published as a book by World Scientific. The work includes more than 200 pages that introduce and elaborate on CTA’s major science themes and place CTA in the context of other major observatories. 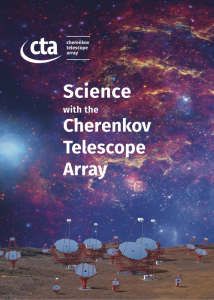 CTA will be the foremost global observatory for very high-energy gamma-ray astronomy over the next decade and beyond. The scientific potential of CTA is extremely broad: from understanding the role of relativistic cosmic particles to the search for dark matter. CTA will explore the extreme Universe, probing environments from the immediate neighbourhood of black holes to cosmic voids on the largest scales. With its ability to cover an enormous range in photon energy from 20 GeV to 300 TeV, CTA will improve on all aspects of performance with respect to current instruments. And its wider field of view and improved sensitivity will enable CTA to survey hundreds of times faster than previous TeV telescopes. CTA will seek to address a wide range of questions in astrophysics and fundamental physics that fall under three major study themes: understanding the origin and role of relativistic cosmic particles, probing extreme environments and exploring frontiers in physics (Chapter 1). “The Key Science Projects described in the document – surveys and deep observations of key objects – will provide legacy data sets of lasting value and will provide important input for the planning of CTA’s user programme,” said CTA Spokesperson Prof. Werner Hofmann. 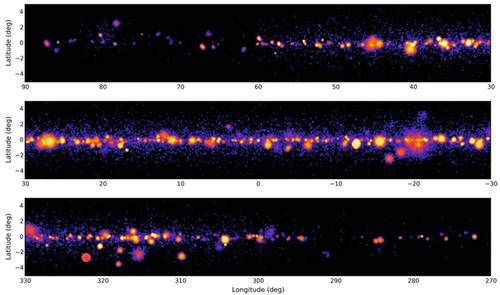 A simulated sky map that will be obtained during the CTA galactic plane survey. Some of the most promising discoveries will come from a survey of our Milky Way galaxy, which should discover more Galactic sources for improved population studies and for advancing our understanding of the origin of cosmic rays (Chapter 6); the search for the elusive dark matter with models not accessible by other experiments (Chapter 4); and the detection of transient phenomena like gamma-ray bursts and gravitational wave events associated with catastrophic events in the Universe (Chapter 9). It has been a decade since science planning for CTA started, resulting in a series of publications in a special edition of Astroparticle Physics in 2013. The current work began that same year with an organized effort by the CTA Consortium to develop CTA’s Key Science Projects (KSPs) in 2013. After three years of development and refinement that included internal and external reviews, the KSPs were incorporated into a single document: Science with the Cherenkov Telescope Array.